The SUMMIT X One is a distributed seismic system specially designed for high resolution 2D/3D seismic surveys. Its unique data telemetry with the lightweight SUMMIT Line cable with SNAP-On technology enables easy and most flexible field deployment even in rough terrain. The SUMMIT X One represents the latest generation of DMT’s long-standing successful SUMMIT product line of field seismographs. 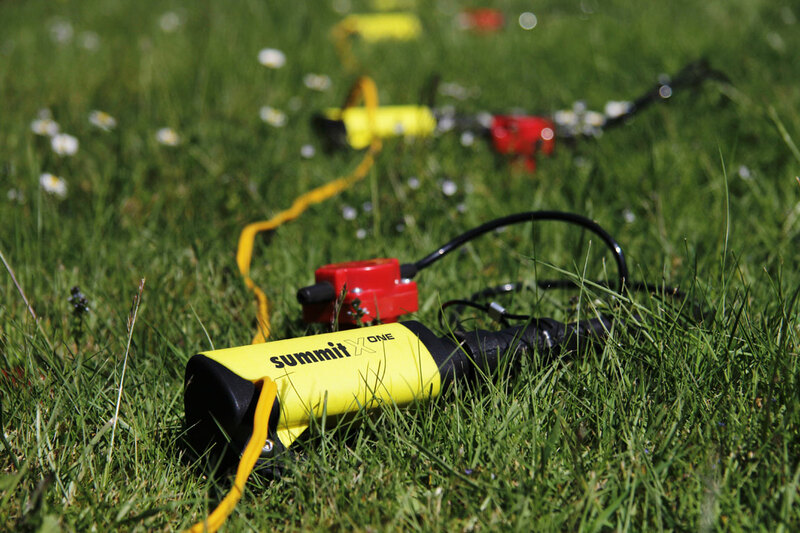 Ultra small one-channel remote units linking to a lightweight SUMMIT line cable via the new optimized SUMMIT SNAP-ON technology result in the world’s most flexible wired seismic acquisition system. As the remote units can snap onto the line at any desired position, the SUMMIT X One provides an optimal solution for high resolution 2D and 3D seismic surveys also in challenging terrain. Any receiver spacing ranging from some tens of meters down to one meter can be realized with the same set of equipment. Reliable and fast data transfer offers immediate and full quality control of acquired seismic data. The option of continuous data streaming also enables passive seismic applications such as monitoring of reservoir stimulation measures. All in all, the SUMMIT X One combines the flexibility in field deployment of a wireless system with all the benefits of reliable online data access from a cabled system. Scalable System – High cost efficiency already from the start with small systems of >24 channels for engineering applications up to large 2D / 3D field deployments with > 3,000 channels. SUMMIT Line Cable – Lightweight 2-wire telemetry cable with easy handling and self sealing coating featuring secure and fast data telemetry as well as power distribution to remote units. Snap-On Technology – Connecting remote units at any desired position to the SUMMIT line cable provides outstanding flexibility for field deployment. The same system hardware can be used to realise totally different field configurations.